A massive series of terror attacks in and around Paris left over 120 people dead across six sites Friday, including at least eight attackers with unknown motivations. At least 100 people were killed at the Bataclan concert hall in Paris’ 11th arrondissement, where scores of hostages had been held. Police in Paris told NBC News that several people had also been shot at a restaurant in the nearby 10th arrondissement in Paris. At the concert hall, the attackers opened fire on a crowd waiting to hear American rock band Eagles of Death Metal perform. Just to the north, loud explosions reverberated around the national stadium, Stade de France, packed with some 80,000 fans watching France beat Germany in a soccer exhibition match. The city’s police chief, Michel Cadot, said the assailants wore explosive belts, which they detonated. The Paris prosecutor Francois Molins’ office said that eight attackers were dead after a string of attacks around the French capital, seven of them in suicide bombings. The eighth attacker was killed by security forces when they raided the the Bataclan. A police union official, Gregory Goupil, said the bombings killed at least three people — near two of the entrances to the stadium and a McDonald’s. The stadium was the first site targeted. From there, the terror spread across the city. There were 14 people dead on one street, five on another, Molins said. French President François Hollande ordered a state of emergency in Paris and closed the country’s borders after the violence broke out. Cadot said one set of attackers was in the city at nearly the same time that another group was at the stadium. “Terrorist attacks of an unprecedented magnitude are in play in Paris. It’s horror,” Hollande said. “I’ve asked for military reinforcements to make sure that no other attack can happen,” Hollande said. Hollande traveled to the Bataclan theater early Saturday morning. “For all those who’ve seen these atrocities, rest assured — we want to say that we will bring the fight against terrorism and will be without pity because when terrorists are capable of such atrocities, it will certainly be faced with a determined France, a united France.” he said from the site of the carnage. Hollande will stay in Paris and wouldn’t attend the G20 summit in Turkey, according to the French government. An additional 1,500 soldiers had been mobilized, the government said. 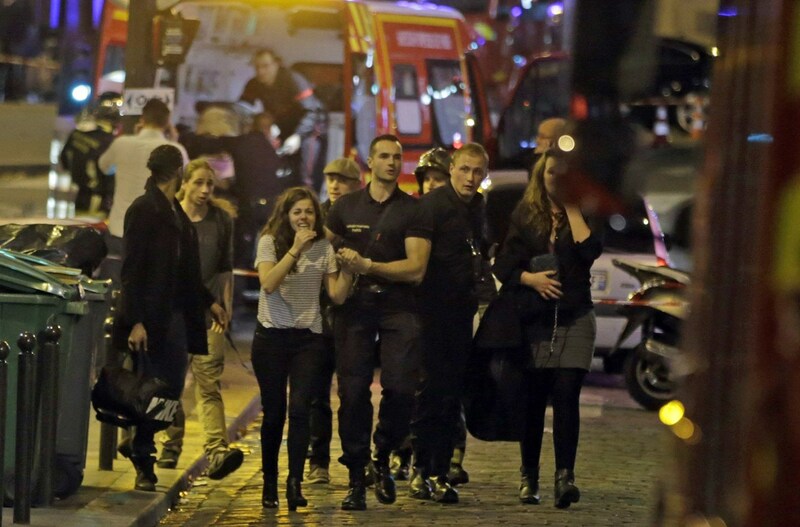 During the attacks, police in Paris urged people in the city to stay inside. Officers were being dispatched to sites around the 10th arrondissement, which is about five miles from the Stade de France, police told NBC News. A Europe 1 journalist who was in the concert hall said there were two or three unmasked attackers with automatic weapons. He said they “began to fire blindly in the crowd,” and the attack lasted at least 10 minutes. Alexandre Bims, 18, was entering Stade de France when he heard an explosion. “We thought it was a gas leak, but then we saw people on the floor that were not moving,” Bims told NBC News. “The police officers did not know what to do, they were choked and dizzy,” he said. “There was a second explosion, we saw someone who lost an arm,” Bims said, adding that after the second blast, he started running. “After five minutes, we heard a third explosion,” he said. “This is an attack not just on Paris; it’s an attack not just on the people of France. But this is an attack on all of humanity and the universal values that we share,” President Barack Obama said in response to the violence. “We’re going to do whatever it takes to work with the French people and with nations around the world to bring these terrorists to justice,” Obama said, adding that he did not want to speculate about who was responsible for the attacks. Obama later called Hollande to offer the condolences of the American people, the White House said. “The President reiterated the United States’ steadfast, unwavering support for the people of France, our oldest ally and friend, and reaffirmed the offer of any necessary support to the French investigation,” the White House said. France has been on edge since Islamic extremists attacked the offices of the satirical newspaper Charlie Hebdo and a kosher grocery store early this year. Twenty people, including three attackers, were left dead in the slaughter. The Bataclan theater is about a miles away from the Charlie Hebdo offices. The American band Eagles of Death Metal were scheduled to play at the theater Friday night. JoEllen Hill-Hughes, the mother of lead singer Jesse Hughes, said all of the band members were safe. In August, a gunman armed with an AK-47 opened fire on an Amsterdam-to-Paris train in France before being subdued by passengers, including three Americans. Three people were injured. Global security firm Flashpoint Intelligence said that it had not seen any claims of responsibility from any terror group in the immediate aftermath of Friday’s attacks. This is a developing story. Please check back for updates. Emmanuelle Saliba contributed. This article originally appeared on NBCNews.com.